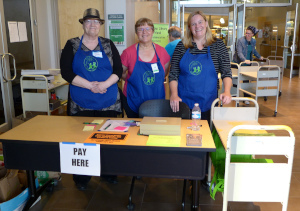 Volunteers are needed for the Spring book sale, May 3-5, 2019. We need volunteers to help with the set-up of the sale Friday morning and the take down on Sunday afternoon. During sale hours, we need volunteers to support the cashiers by tallying up sales and also to assist our customers on the sale floor. Set up for the sale will occur on Friday 5/3/19, from 9 am to 1 pm. Shifts through the weekend during the sale are for 2-3 hours at a time. 6. You’ll receive a confirming email after submitting your sign-up. And you’ll receive a reminder close to the sale date.